Fooled Again played by Richie Kotzen and band live in Sao Paulo, Brazil. So the big day was finally here – the team & I were going out one final time. We’ve never spent a whole day out of the office together since January 26 last year. That day I conducted a 4 hour workshop in a hotel boardroom on training & presentation and then it was another 3-4 hours of fun and games along with a big lunch. This time it was going to be just pure fun and camaraderie and a farewell/thank you day. Farewell from them to me and a thank you from me to them. Unfortunately as we all know these days always fall short of being perfect. Wasim canceled at the last minute, calling me last night to tell me that due to a family emergency he was needed to be with his family and go to settle a property issue which he needed to be present for and sign in court. So he couldn’t come but the others would be there. We had also called up Ajeeba, who had resigned back in July 2010 and since we had all kept in touch with her, she was game to come as well. Rajeesh has a car that he had recently purchased and we just had to worry about the fuel cost and the food that we would eat. 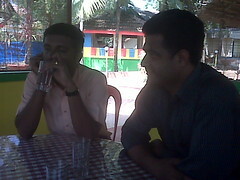 So we planned to start out from our homes at 8 am and meet up at Kaloor 30 minutes later. I woke up at 6 am and got ready and by the time I reached the designated meeting point at 8:30 am Rekha & Firdous who had left Kalamassery together were already there waiting along with Rajeesh next to his car. I hopped into a nearby ATM and then joined them. 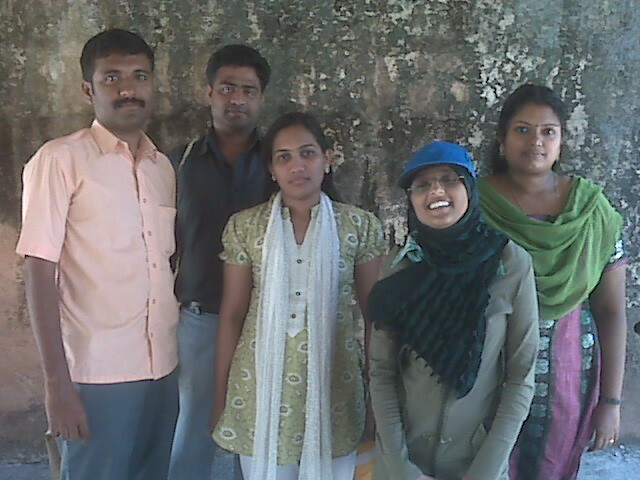 In a few minutes Ajeeba arrived and we set off in the car to Vytilla to pick up Roopa, the 6th person for our trip. She joined us and brought breakfast with her – poori, chappathy, tomota & onion fry and potato curry. We rode in the car, talking & laughing all the way. On the way over to Alleppey we stopped the car at a shady tree as we were getting quite hot and everyone wanted to drink something. 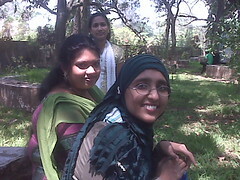 Next to the tree was a small shop selling tender coconut water and we all drank some to quench our thirst. 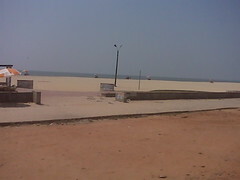 Refreshed, we got back into the car and soon we reached Alleppey and found our way to the beach. Gorgeous beach but it was a very hot day. We parked the car next to a tree (I see a trend here) and then bought a couple of bottles of cold water at a open style restaurant. The owner invited us to sit and eat our breakfast using his tables as the place was quite empty at that hour. So we dug in and enjoyed the well prepared food. We also bought some ice cream from the shop as it was blazing hot. 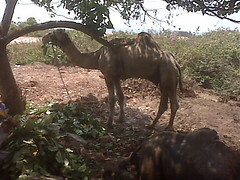 Near to the parked car and under another huge tree were three animals – a horse and two camels! 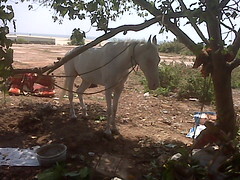 People can rent the camels for a ride on the beach but the horse didn’t seem to be for customers to ride. 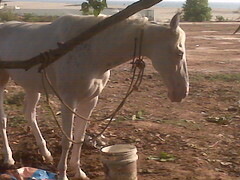 Besides the horse looked like he was an albino and I was wondering how the hot sun fared his skin. It’s so nice to stand in the breeze, under the shade and watch these animals chew lazily on their food. Like they don’t have a care in this world other than how much to chew and how much to drink. I love horses, although I don’t ride them but I love watching them. Much later when we came back to the area, the horse was by himself and chewing endlessly on some of his food kept in a bucket and some water in another. He was also chewing on some big leaves kept near by, which the camels were feasting on earlier. Now he alternated between the food in the bucket and at times would take a few steps towards the leafs and eat them to. People stopped by to look at him and try and pet him. He was having none of it and nobody could get close enough to pet his head. I was standing there for a long time (while the others rented a boat) and admired this big horse. I tried calling him and after about 30 minutes to my surprise he moved towards my direction. I was wondering if he would come close enough for me to touch him….when the bugger let go of a big stream of stinking urine! I was standing right in front of his toilet area. Fucked could have warned me and not let me get my hopes up! The day was quite hot and we started sweating a lot. The shop guy told us about a little picnic area about 0.3 kms away which has a lot of trees and shade and we could spend a lot of time there. We made our way over there and found a bunch of big trees with some seating area that they had built around each. We talked for a long time and the girls enjoyed some time on the swings hanging from the tree branches. We must have spent almost 2 hours there talking up a storm. By lunch time we were quite hungry and famished and we got back into the car and looked around for a nice place to get some lunch. Not finding anything good & within our budget nearby we went about 5 kilometers away to find a hotel that had sit out shacks with lots of open space. We stopped there and ordered lunch – 3 people had rice meals, 3 of us had fried rice and one also had chicken fry. 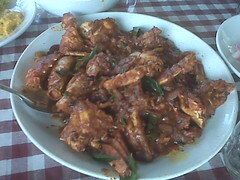 The rest of us gorged ourselves on two types of fried fish, crab with gravy and prawns. The food was absolutely delicious and fantastically prepared. I didn’t eat any chicken or the prawns but I enjoyed my fried rice with lots of fish (look at that monster we ordered below) and some crab. Superb food and we washed it down with some lemonade. All that food, so delicious but the end bill for us was quite reasonable. It worked out quite nice and if I am ever in that area, I will be looking out for Vrindhavan Hotel. 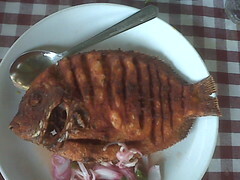 Take a look at the big karimeen fish fry and the superb crab curry that we had. Bellies filled and full up we had to sit there for another 20 minutes or so just because we couldn’t get up. I can’t remember being this satisfied after a big meal. A quick visit to the toilet to freshen up we got back into the car, a little cramped up as we all seemed to be bigger this time around and headed back to the beach. Some wanted to ride the camels and dip their feet in the sea but Ajeeba and myself waited in the shade of the tree inside the car and talked for a long time catching up with things that had happened since the last time we had met. Although she was aware of the stuff that had been going on at the office, it’s a different feeling when you talk it out face to face. Camel rides over we decided to get back on the road and make our way back to Cochin and we set off in the car just as the sun started setting a little bit. 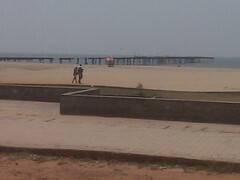 It was around 5:45 pm and luckily the ride back wasn’t as hot as it was going to Alleppey. Around 7:30 pm we stopped at a highway restaurant to get some coffee and tea and talked for a little bit more. Once we reached there, 3 of us decided to make ours cold coffees as it was still quite a hot day. 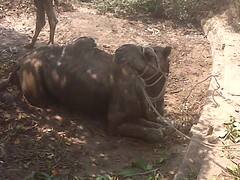 20 minutes later we dropped Roopa just outside her home and then dropped Ajeeba at her husband’s office. It was about 8 pm then and then Rajeesh dropped both Firdous & Rekha at the Janata bus stop, as they needed to head back towards the Kalamassery area and then I got down near the Kaloor bus stand. I waited for a couple of minutes and got into an auto towards my home. I stopped at a shop to buy some Sprite to cool off completely and put the bottle in the freezer as soon as I reached home. 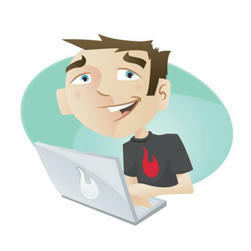 I stripped my clothes off and took a long cold shower to wash away the dirt and stuff that I would have accumulated on the day long trip and then sat down at my laptop with my bottle of Sprite. Today was a great fun filled day and I am so happy that we could all share it. Shame that Wasim couldn’t join us but I still had a wonderful time and I will keep this one for the ages.